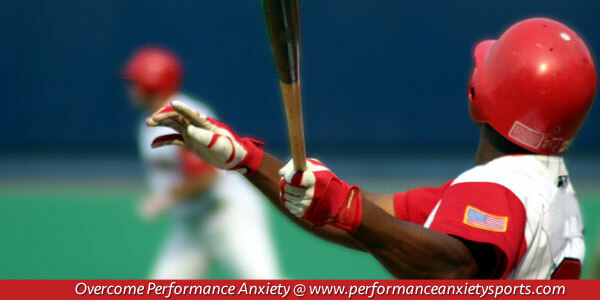 You are here: Home / Athletes and Performance Anxiety / Do You Get Nervous Before Big Games? Do you get nervous before the “big game?” At critical times during games, do you choke under pressure? Would you define yourself as an anxious athlete? Anxiety is a feeling of worry or fear, typically about a big game or when feeling under the pressure to perform well. Anxiety is created over the uncertainty of what may or may not happen. Let’s focus on two aspects of anxiety: the unknown and outcomes. In essence, all outcomes in sports are unknown since no one can predict the future. How do professional athletes attempt to remedy these two aspects of anxiety? For one, athletes and coaches attempt to manage anxiety by focusing on the process rather than the outcome. Focusing on the process is the ability to focus on your performance cues and not allow your mind to wander to the future. This type of focus increases an athlete’s confidence, fosters a sense of control, sharpens attention and enhances persistence. Another method for managing anxiety is by eliminating unknowns. The “unknown” cultivates fear and anxiety. For that reason, professional teams scout opponents to prepare for each game. They also rarely attempt new skills in games before mastering them in practice. The revamped Boston Red Sox have excelled in minimizing the unknowns with astounding results going from worst to first. In 2012, the Boston Red Sox were a dysfunctional group of characters self-absorbed with their own individual statistics and lost 93 games finishing 5th in their division. Many changes were made to the team for 2013 including the hiring of a new manager, John Farrell. The personnel turnover was accompanied by a change to a “team” mentality where each player had a clearly defined role on the team. The result ended in the Red Sox clinching their division. Farrell identified the clarification of roles as the reason for the Boston turnaround, “Being decisive lends to direction. It’s important for a group to have a direction. If guys have an understanding of what their role is, they can anticipate it as it is coming. By naming a reliever in a closer role, there’s clarity to it. Any time you have clarity, there’s going to be less anxiety, less unknown.” Farrell has a great grasp of the root anxiety and how to manage it… clarity (the known) helps alleviate anxiety (worry of fear of the unknown). Identify your strengths and how you can best contribute to the team. When competing, focus on what you do best. Identify areas of your game that you can control and let go of the things you can’t. Do your homework. Thorough preparation helps you focus on your game. Focus on what YOU can do now. This is the best plan of attack for competing at your highest level.